Kane County Fairgrounds, 525 S Randall Rd., Saint Charles, Illinois Times: Saturday 9:00 am-5:00 pm and Sunday from 9:00 am-3:00 pm. Cost $7/person or $5/period dress or $10/weekend pass. This is the third annual trade show and it's grown since it's first year. Food is available on site with over 50 vendors. Sandusky County Fairgrounds, 901 Rawson Ave., Fremont, Ohio Times: Saturday 9:00 am-5:00 pm and Sunday from 9:00 am-3:00 pm. Cost $5.00/person or $7.00/weekend pass. Really good home cooked food & beverages are available, drawings for free prizes & a book signing by Matt Wulff besides lots of merchants for your winter projects. Hamilton County 4-H Fairgrounds, Novlesville, IN. Wm. Booth, Draper has never attended this show so it will be a new experience. This trade fair encompasses the years 1700-1899 and has been running for 36 years. Food is available on site and there are over 240 tables selling hand crafted items, antique arms, pottery, etc. Echoes of the Past trade show includes merchants and classes for reenactors, dealers, educators, related crafts people, historians, and the general public interested in the mid 1700s to the 1860s. It's open to the public Saturday 9-5 and Sunday 9-3 with a $5.00 door fee for everyone over 10 years of age. Food is available on site and parking is free. Assembly Hall, Greene County Fairgrounds, 120 Fairground Road, Xenia, OH. Admission is $4 per person, $3 if dressed in pre-1890 clothing; children 12 and younger free. No animals allowed but there is food available and carpeted floors. Miami Valley Center Mall Comfort Inn, Piqua, OH. The Midwest Open Air Museums Coordinating Council is the Midwest regional affiliate of the Association for Living History, Farm and Agricultural Museums. At their Spring Conference they have classes on many topics of interest. The vendors at this event are open to members but also the general public at no fee. You must become a member of MOMCC or ALHFAM to attend classes. This is the largest indoor trade show in the Midwest with hundreds of merchants and classes providing goods for pre 1890s reenactors, dealers, educators, related crafts people, historians, and the general public. April 6 - 7 Cancelled for closed flood gates. Fort de Chartres State Historic Site 1350 State Route 155 Prairie du Rocher, IL. 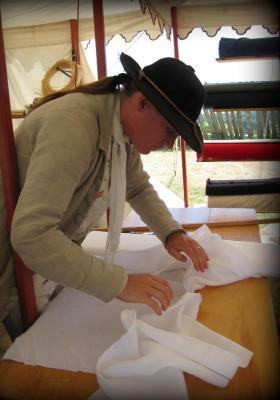 The recreated fort is worth a visit for the Colonial Trade Faire and Musket and Rifle Frolic. This event has a good showing of merchants along with an accumulation of civilians. This event in Big Pool, Maryland represents eastern North America from 1730 to 1790. At the fair you will see sutlers, traders, street vendors, entertainers, individuals, groups, military units, and American Indians portraying the 1730s up to the early republic. Wilderness Road State Park 8051 Wilderness Rd Ewing, VA 24248. The recreated frontier home of Joseph Martin is raided at dusk 8:30 by Native American Indians. This is quite a show for the public along with burning of parts of the settlement. Various seminars on 18th century topics are conducted by well known historians and lecturers. 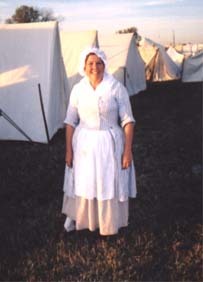 There tends to be a large number of merchants along with food served on site along with a large number of settlers. Alamance Battleground State Historic Site 5803 S NC Highway 62, Burlington NC 27215. A recreation of the events that led to armed conflict on May 16th 1771! A large number of farmers who called themselves "Regulators" met the loyalist militia of Governor William Tryon at this site. A prelude to the war of revolution to come this rebellion was quickly suppressed. A late 18th century cabin has been moved to this cite along with a small visitor center. A good collection of grass roots participants occupy the cabin and grounds along with only a few merchants. Spirit of Vincennes Rendezvous, Vincennes, IN. An American Revolutionary War reenactment on National Park Service land (free to everyone) with a Rendezvous directly across the street ($10 adult, $2 ages 6-12 gate price with $3 parking). This event is filled with great entertainment, lots for children to do and is one of the largest Revolutionary War events in the Midwest. Although there are many things to do, one of my favourites is the Old Cathedral, Basilica of St. Francis Xavier which was first built in 1826 on the site of older churches. Battle for Newbury, Spencer-Peirce Little Farm, Newbury, MA. This will be our first time at this site. Interestingly, this will include battle scenarios that will play-out this “what-if" alternate history scheme that might have changed the course of the American Revolution. Besides including an interpretation of military and civilian life there will be historic merchants, modern food vendors, as well as Ipswich Ale and 1634 Meadery purveying their locally crafted beer and mead. There is a gate charge of $8 adults, $7 seniors, $4 students. A reenactment of the French and Indian War and Old Fort Niagara's largest event of the year. If you have never been to Fort Niagara this is worth a visit. A Brigade of the American Revolution reenactment that will feature constant interpretation and a wide range of educational programs including musket and artillery demos, maritime programs, vignettes from that fateful day and an interpretation of the assault itself. Montcalm's Cross has strict authenticity standards set on the grounds of the actual battle in the beautiful mountains of upstate New York. A select set of vendors of period goods will be available and good food is available in the fort visitor's center. If you haven't been to Fort Ticonderoga in recent years you'll enjoy the updates to the displays and the attention to detail. Admission at the gate is $24 adults, $22 seniors, $12 for children 5-15 years old. A 1790 to 1810 early republic trade fair with lots of good demonstrators and merchants. This is a large event with three working taverns, a coffee house, livestock and great entertainment. Laura and Paul worked at this event over 10 years ago and are excited to revisit old friends. There is a small fee for visitors. Feast of the Hunters' Moon at Fort Ouiatenon is a mid to late 18th century annual fall gathering that has continued for over 51 years. There's a fee for public to attend that varies for advanced or gate, family or single. Mississinewa 1812, Marion, IN is the largest War of 1812 event in the United States. This event has great entertainment and shopping. A revolutionary war reenactment of the most historically accurate impressions to be found within a historic park with 88 beautiful rolling acres. This event has a $5 general admission charge for visitors.